Dainese Men's Hp1 P M1 Pants Black-iris XXL . Dainese Armoured protection shorts Ce Body Protection in Size L. Condition used. 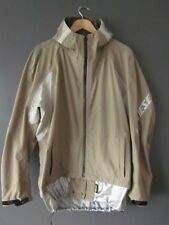 BNWT,,DAINESE HP1 M3 Men's Sml SKI Insulated Hooded Jacket;Shop tagged unused!! It has a fully waterproof, seam sealed D-Dry exterior and the full features expected of a ski. jacket, including a thumb loop, powder skirt, pass pocket and a removable hood. - Removable hood. - Down 95/5 Fill Power 800 insulation. Pit to pit = 26”. - Centre base of collar to hem = 28”. - Centre base of collar to cuff = 36”. All collars and cuffs are clean crisp and sharp. - Weight : 1.08 kg approx. Dainese Men's Hp1m3 Ski Jacket Chilli-Pepper High Risk Red Size Medium. Condition is New with tags. Dispatched with Royal Mail 1st Class recorded delivery. Stunning brand new and unworn. Any questions please ask. This glove was designed with the snowboarder’s needs for comfort and safety in mind. Featuring the patented integrated anti-shock Hector™ wrist guard. The glove is completed by cuff drawstring closing. The jacket therefore has thicker insulation for added warmth and wind protection to help prevent chill as well as a slightly increased length. - Removable and adjustable hood. - Side zip vents. - Water column 20.000 mm. Never worn red Dainese SKI Jacket 'Kelly'. Waterproof. Back protector. E: 40 cm (15.7"). CODE- Y-51. F: 54 cm (21.3"). D: 65 cm (25.6"). C: 47 cm (18.5"). BOYS DAINESE WHISTLER MOTORCYCLE PANTS. WHISTLER JUNIOR PANT. IN EXCELLENT CONDITION. MINIMAL SIGNS OF WEAR AND TEAR. THE ITEM MUST BE IN THE ORIGINAL NEW CONDITION. (IMPERIAL ) INSEAM. P O S TA GE. High quality Dainese snowboard trousers. Dainese safety zone armour on knees and coccyx - giving you solid protection in these zones. Condition: Used, Clothing Type: Salopettes & Trousers. RRP on these when new was around £200. Dainese Natalie 13 D-dry Gloves. RRP £80 Size Large (7.5). THE DAINESE SIZE GUIDE FOR THESE GLOVES IS SHOWN IN THE PHOTOGRAPHS. WHAT DAINESE SAY. The glove is completed by a wrist fastening system with strap, a gloves coupling clip, and a safety cord. Dainese Natalie 13 D-dry Gloves. RRP £80 Size XS (6). THE DAINESE SIZE GUIDE FOR THESE GLOVES IS SHOWN IN THE PHOTOGRAPHS. WHAT DAINESE SAY. The glove is completed by a wrist fastening system with strap, a gloves coupling clip, and a safety cord. Performance Main materials. ultra-breathable composite protector for the elbows in perforated polypropylene. The ergonomic back protection is equipped with 7 plates with a honeycomb structure. The Active Shield 01 EVO back protector has a short fit and is suitable for people with a smaller back. Series: Active Shield 01 Evo. Similar to the Active Shield Evo the Active Vest protects your back with strong and flexible mounted plates without feeling immovable. Lycra® vest construction wich also eliminates any slipping of your protection. DAINESE Active Elbow Guard Evo. Circumference: 19". Dainese Kid's Flexagon Waistcoat Ski Protector, Vapour Blue/High Risk Red, JOne sizeor X-Large. Studio: Dainese. Colour: Vapour Blue/High Risk Red. Orders will be fulfilled by our own warehouse or a 3rd party supplier at our discretion. Junior Large 56cm. Expanded polystyrene inner shell with ventilation system. Internal shell in polystyrene foam with ventilated structure. Back goggles strap fastening buckle, band with quick-release buckle. The bright colours are fun for the kids to wear - and it makes it easier for you to spot your child on the slopes too! Size S - 52cm. With a few slight scratches (almost invisible) - see photos! Weight: 480g. These Dianese shorts are in a well worn condition but they still have a lot of life left in them. Brand new with tags. One size, made for ladies. 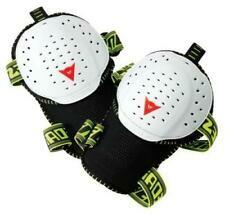 ACTIVE KNEE GUARD EVO ski protection for knees and shins. Safety and comfort. Ultra-breathable latest-generation composite protector for the knee and the upper part of the shin in perforated polypropylene. The area under the protectors is provided with a material in double jersey mesh. A layer of Crash Absorb® material is inserted between the two hard plates. Closing system with double adjustment strap. The bright colours are fun for the kids to wear - and it makes it easier for you to spot your child on the slopes too! With a few slight scratches (almost invisible) - see photos! XS - 50cms. Weight: 480g.